Founded, in 1939 by Charles O. Johnson our chapter has a total of 921 members – membership is for life. In Fall 2017, as the Director of Undergraduate Studies of the School of Politics, Philosophy and Public Affairs (PPPA), I re-launched our chapter. 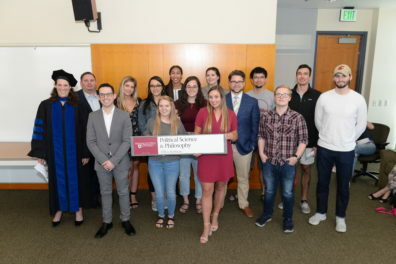 Our first class was comprised of 23 majors who received their honor’s certificates and regalia at PPPA’s awards ceremony last April. We will be having a second convocation ceremony this April for our next class of society members at the School’s Awards event this April. We will be contacting all Political Science majors with a 3.0 GPA or higher this month to invite them to become members. Membership is $35 with the possibility of purchasing an honor chord and pin for a minimal additional amount. Membership allows you to take advantage of Chapter and National level funding, services and activities- see below – and it looks great on your resumé. 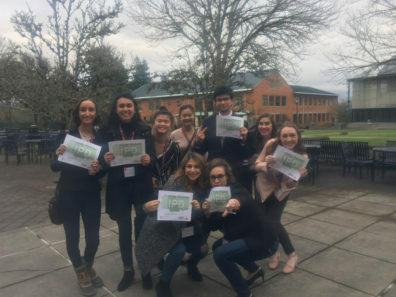 This year we received a Chapter Activity Grant from the National Honor Society ($1500) to fund the attendance of chapter members to the Conference on Initiative on Public Deliberation in late February at WSU-Vancouver (see below). Many thanks to Nicholas Lovrich (Political Science Emeritus) for his generous contribution to this effort ($500). Following a successful year of recruitment in 2016-17 when we re-vitalized the chapter – it had not been active since 2010 when we had 23 numbers, this academic year we sent out invitations to 167 eligible political science members. This year we had a total of 43 new members with one faculty member and 6 graduate students. The class of 2018 went through a convocation ceremony at our Schools Awards Ceremony on April 24th (photo). To date, since Fall 2016 we have 69 new members and since our chapter was created in 1949, we have 962 members. Pictured above: From February 2018, students at the Initiative for Public Deliberation, a collaboration between Washington State University Vancouver and the Thomas A. Foley Institute for Public Policy and Public Service.